Earlier this month, we asked you to dress like QuiBids for Halloween and post a photo of your Q-style costume on Twitter or Instagram with the #DressLikeQuiBids hashtag for a chance at five FREE 5X Gameplays. We had so much fun going through all the photos, and again were impressed at how creative you guys are. There were so many great submissions, but we must pick just one to win the HUGE Gameplay reward. 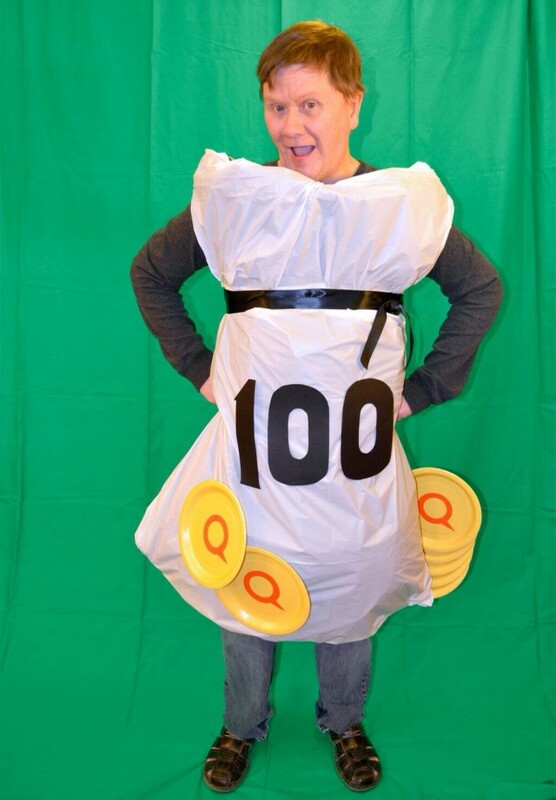 Congratulations @SeriouslyPlusWh on Twitter for making this super-creative 100 Voucher Bid Pack costume. Enjoy the massive amount of bids you’re about to receive from your five 5X Gameplays – and just in time for the holidays too! We love a good QuiBids-themed pumpkin, and this one is no different. However, the adorable kids most definitely turn the cuteness level up a few notches. Here’s a cute one from Facebook regular, Antonio. Do you recognize those fierce avatars? Have we mentioned how much we love QuiBids-themed pumpkin carvings? We have? Okay good. Now this one’s just too cute. We can’t tell if it’s because of the sideways hat or the word bubble that says he loves Q, but this pumpkin is just too cool. If Voucher Bids took selfies, it’d look something like this. Thanks again to all of the great photo submissions. We had lots of fun with them, and we hope you had just as much fun creating them. Everyone stay safe and have a Happy Halloween!